I've been working on graphics for a slideshow in ubiquity. Actually, I've done that before, but this time it isn't just mockups. Dylan McCall has been working very hard on this project and after posting my mockups on the mailinglist, he created a Bazaar branch titled madsrh-layout. Steve Dodier (SiDi) help me with the code for my mockup and took on the two complex tasks of rewriting the code and explaining it all to me - thanks. This project will have to be ready before feature-freeze. If it gets approved hopefully it will land in Ubuntu 9.10. Of course this work will also have to match the look and feel the design team at Canonical is working towards. 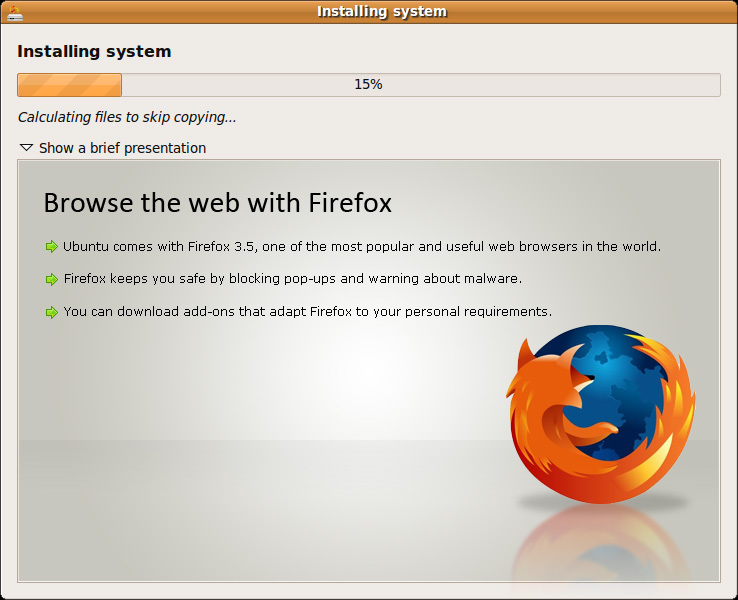 Nice, but the logo of Firefox should be the new one, as it will be Firefox 3.5. Andrew -> The text will look somewhat different. It will not be part of the image, it will be HTML/CSS code.